Details: 3 BR, 3.5 BA Condo with approx. 2,301 square feet. Details: 3 BR, 3.5 Ba Condo with approx. 2,350 square feet. Details: 3 BR, 3.5 BA Condominium home with 2,300+/- square feet. Details: 5 BR, 5.5 BA Penthouse Condo with 5700+/- square feet. 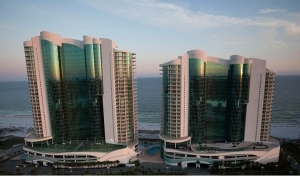 Turquoise Place Condominiums, located in Orange Beach Alabama on the white-sand beaches of the Gulf of Mexico, enjoys a year-round mild climate and is a popular family beach vacation destination. The area offers a variety of activities including dolphin cruises, championship golf courses, charter fishing and nature hikes. Choose from national hotel and motel chains, camping or a variety of beach accommodations from private vacation rentals property management companies with huge inventories. There are numerous options for nightlife, from family entertainment to rocking roadhouses, enjoy your pick of plays, free concerts, dancing or just listening to a variety of musical genre. Enjoy the freshest seafood available at the numerous Orange Beach restaurants featuring fine-dining to laid-back local favorites. If you're looking for an Orange Beach condo or beach house - you can find it all on Alabama’s Gulf Coast.